You want the best for your pet. We do too. Let us show you how proper nutrition and care can not only improve the overall health of your pets, but extend their lives. We specialize in natural and holistic pet food, pet treats, and supplements, and also carry a wide selection of Health & Beauty supplies (shampoos, grooming tools, dental products, etc. ), toys, carriers and crates, beds, clothing, leashes and collars, training tools. You will find the essential pet products that all pet lovers need in caring for their companion pets, whether they are cats and dogs, birds, fish, or small animals such as hamsters and ferrets. We know that caring for pets can be challenging when they won't eat or experiencing health issues. Whether they suffer from allergies, dental issues, joint stiffness or a myriad of other health problems, we understand that you just want to help them. We pride ourselves on being pet nutrition and pet care specialists and we will use our knowledge and expertise to help you find the right solutions for your companion pets' needs. 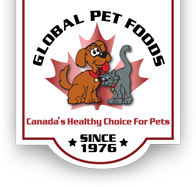 Our Global Pet Foods Healthy Pet Care Specialists will recommend the best brand of food, supplement, treat, toy, or any other pet product - along with great pet care tips - so that your companion pets can be healthy and happy!